The name Bellis is Greek for “pretty,” and these charming flowers live up to their name. Easy to grow, with a long flowering season, the numerous button flowers appear from early spring until late autumn. Trouble-free, with few pests or diseases, it is an excellent choice for mixed borders in a well-drained location with sun or part shade. Deadheading will prolong flowering, and the plant is usually treated as a biennial. The young leaves and petals can be added to salads. Flower buds can be pickled in vinegar and used in place of capers. 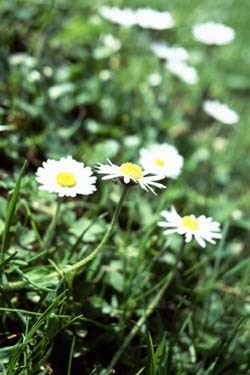 English Daisy has a long history as a calmative for inflamed skin and for stomach and intestinal problems. John Gerard’s Herball, or Generall Historie of Plants, (1633) advises “The daisies do mitigate all kinde of paines,” and directs those suffering from gout to apply them to painful joints with butter. According to Gerard, the daisy was once known as bruisewort, for its ability to soothe bruises when the leaves were applied externally. Sow seeds outdoors in shallow trenches in Spring, thinning seedlings to six to nine inches apart when they appear.